The Hub on Causeway — The Green Engineer, Inc.
Delaware North and Boston Properties formed a partnership to develop over 1.5 million square feet of mixed-use retail, office, hotel, and residential space and an expansion of TD Garden on the 2.5 acre site of the former Boston Garden at Causeway Street. The Hub on Causeway will be constructed in three phases. 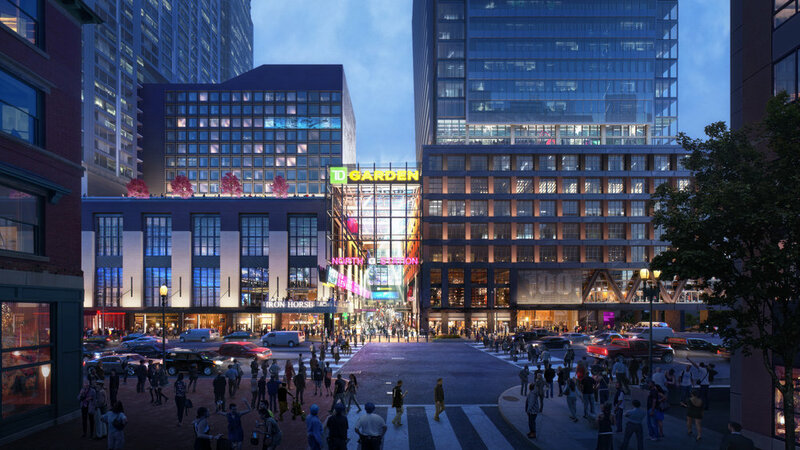 210,000 SF of multi-level retail/restaurant space, including the city of Boston’s largest supermarket, a 60,000 SF supermarket and the Northeast’s first ArcLight Cinema, ArcLight Boston, a 60,000* SF theater with 15 screens. 10,000 SF of outdoor space for a new entrance to TD Garden and North Station. 540 spaces of below grade parking which will be connected to the existing North Station garage. 64,000 SF of expansion space for TD Garden on floors 3-9. Residential tower including approximately 440 units in a 38-story tower. Hotel including approximately 260 rooms in a 10-story tower. Office Tower including approximately 525,000 SF in a 21-story tower. The Green Engineer is providing sustainable design consulting services on select phases of this project, including LEED Certification Project Management services for the ground level podium phase as well as for the residential, hotel and office tower phases.